Students working in a classroom of Gateway Science Academy. A nonreligious school that receives tax dollars and is controlled by a nonprofit organization (though it can hire an education management organization, which can be for-profit, to run the day-to-day operations of the school). All charter schools must have a state-approved sponsor, which Show Me Institute education policy director Michael McShane describes as “the conduit of state funds.” In Missouri, sponsors are primarily universities, though the Missouri Charter Public School Commission or a school district can also serve as a sponsor. “What the word charter comes from is the charter, or the agreement, that the school makes with its sponsor,” McShane said. What is the difference between a charter school and a public school? 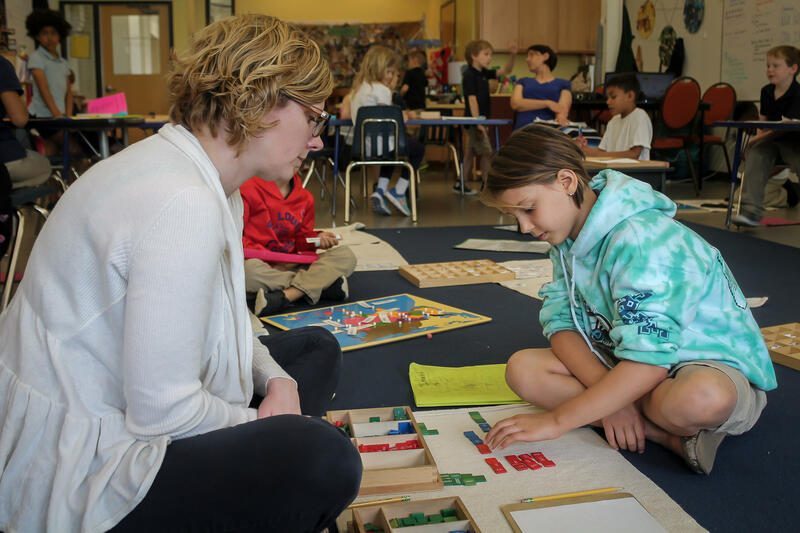 City Garden Montessori teacher Anne Lacey works with student Imani Palada, 8, on math problems. Charter schools and public schools have the same state and federal standardized testing requirements because they are publicly funded, according to Chris Neale, an assistant commissioner with the Missouri Department of Elementary and Secondary Education. But while the scores for both types of schools are published yearly, charter schools’ accreditation doesn’t depend on its test scores and the state has less direct oversight. That’s between a charter school and the sponsor, which sets measures like test scores and graduation rate targets to hold charters to. The differences are vast: Students are not assigned to a charter school, but rather, their parent or parents choose to send a child there. There are no entrance exams like public magnet schools, and if more children apply than there is space, charters must hold lotteries. Since charter schools aren’t part of a broad district, they tend to have less bureaucracy. They also have more flexibility when it comes to the number of hours of instruction, both daily and in an academic year. And curriculum is usually more diverse, with themes like foreign language immersion, social skills or Montessori ideals. Who goes to charter schools in Missouri? 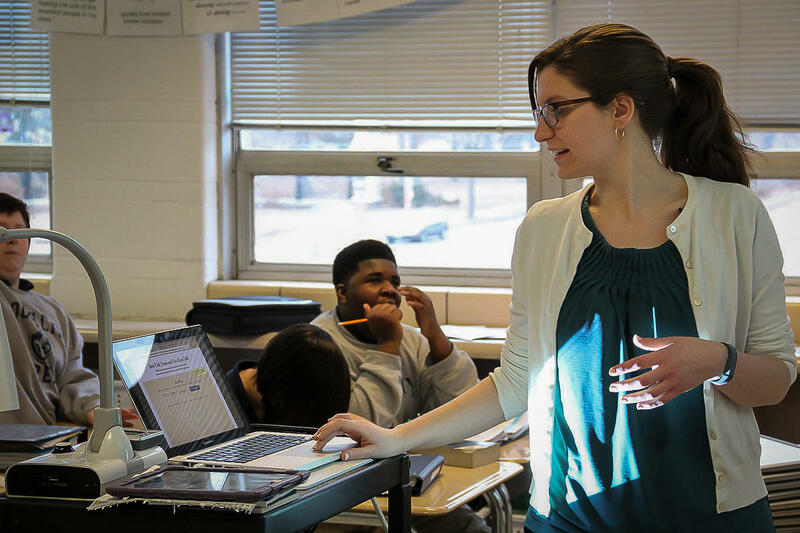 Eighth-grade teacher Kate Berger leads students through a classroom exercise at South City Preparatory Academy, now St. Louis College Prep, in February 2015. Charter schools are allowed to operate within the same boundaries of St. Louis Public Schools and Kansas City Public Schools. There are 31 charters in Kansas City and 30 in St. Louis, a number that changes from year to year depending on closures and newly approved schools. In St. Louis, about a third of children in public schools — 11,120 — are enrolled in a charter, according to the Missouri Charter Public School Association. 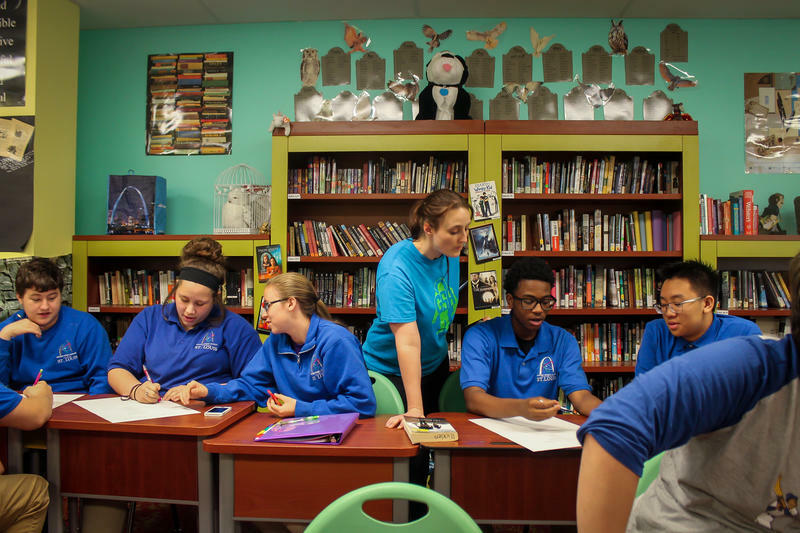 Any school-aged child in St. Louis can go to a charter school, though some focus on specific geographic areas or serve only boys or girls, like the Hawthorn Leadership School for Girls. What’s the most recent law on charter schools? In 2012, the Missouri Legislature changed the law to allow for charters to also open in districts the state has labeled as failing. A bill allowing the further expansion of charters has cleared the Missouri House this session, but hasn’t been voted on in the Senate yet. How do you open a charter school in Missouri? 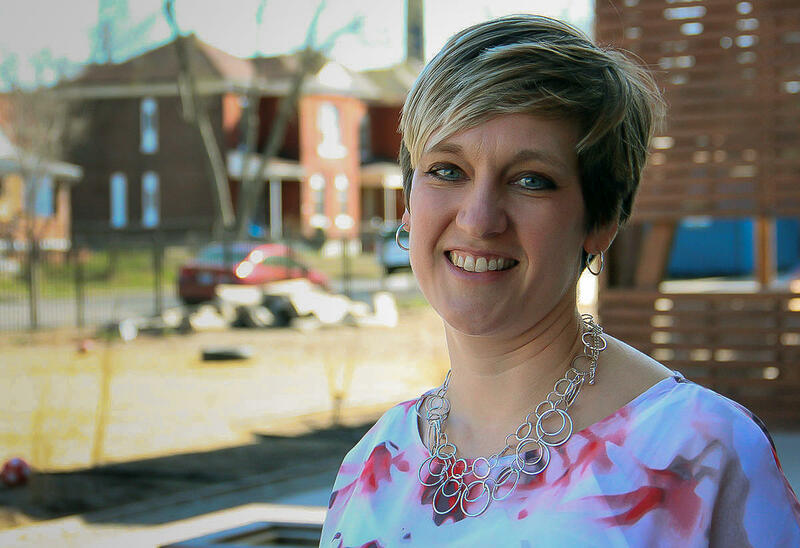 Christie Huck, pictured here in March 2016, helped start City Garden Montessori School as a parent. She's now executive director of the charter school in St. Louis' Botanical Heights neighborhood. No matter the group that wants to open one — which can be anything from a national corporation or to a group of local parents — they have to find a sponsor and submit an application that details, at least, financial strategy, the number of students it will serve and what and how it will teach them. That sponsor reviews an application. If it isn’t rejected, the sponsor sends a letter of support with the application to the Missouri Department of Elementary and Secondary Education, which signs off on charters for five years at a time. How does a charter get closed in Missouri? There are a few ways, but one is abundantly clear: “If you don’t have enough students to keep the lights on, your school will close,” McShane said. A sponsor can pull their support if a school is failing. Unless that school can find a new sponsor, it will close. However, if the state Board of Education really wants a charter school closed, it can revoke a sponsor’s credentials, removing a key link in the chain. 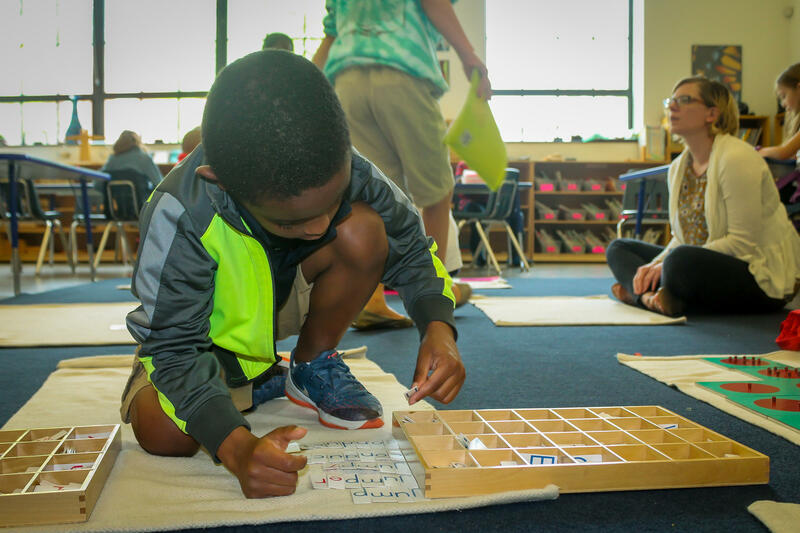 Shannon Seals, 7, works on learning word suffixes at City Garden Montessori School last month. Nationally speaking, some urban school districts have struggled for decades to successfully educate their students by the measures placed on them by state and federal governments. St. Louis’ public school struggles began in the second half of the last century, when wealthier, predominantly white families moved to the suburbs and away from minorities — known as white flight. That left the district with a shrunken tax base from which to fund its schools, leading to educational issues. So-called school reformers believe traditional public school districts are bogged down by mandates, standards, teachers’ unions and their sheer size. Plus, charter schools give parents the option to send their kids to a different school for free rather than having to send them to a struggling neighborhood school. But the freedom to choose is a point of contention for traditional school advocates, such as the Missouri School Boards’ Association, which argues that giving taxpayer money to independently run schools lessens the accountability and control over public money. St. Louis Public Radio's Camille Phillips contributed to this report.